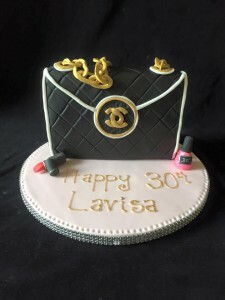 A Black Chanel Handbag birthday cake to celebrate a 30th birthday. Chocolate biscuit cake covered in black fondant with white trim & beauty gifts. Finished with diamond board trim. 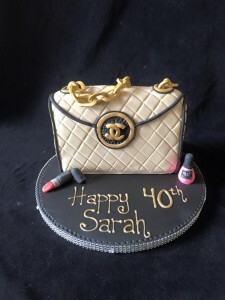 A great surprise cake for a fashionista! My second fashionista cake this week! This time it’s a Mint Chocolate Biscuit Cake covered in tan fondant with black trim, with mac lipstick & nail varnish.